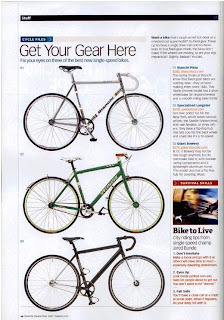 The current issue of Maxim with the lovely Eva Mendes on the cover has an article "Get Your Gear Here" about the best new single-speed, or fixed-gear, bikes. They write, "These cycles have a single drive train and no derailleurs. In true fixed gear mode, the bikes don’t coast; if the wheels are moving, so are your legs. Impractical? Slightly. Badass? You bet." Bianchi Pista ($580): The racing freaks at Bianchi know that fixed-gear bikes are nothing new – they’ve been making them since 1886. This flashy chrome model has a short wheelbase for responsiveness and a smooth-riding steel frame. Giant Bowery ($575): N.Y.C.’s Bowery may not be that tough anymore, but its namesake bike is, with durable racing components and a lightweight aluminum frame. This model also has a flip-flop hub for coasting. Wuss. Don’t hesitate. Make a move and go with it so others will have time to react – especially dawdling pedestrians. Eyes up. Look inside parked cars and taxis for people about to get out. You don’t want to be "doored." Fall safe. You’ll have a close call or a crash at some point. When it happens, let your body roll with it. We've got a few of the '07 Pistas left in stock in our stores now; we expect to have both the new '08 Pistas and the '08 Bowerys in time for the holidays. The size of the fixed gear bandwagon is puzzling to a lot of folks. I say; Don't knock it till you try it! I am a big fan of fixed riding and think that any bike dude that hasn't tried it is missing out. Single Speed and Fixed Gear bikes may not be best suited as your primary steed but can be tons of fun for riding the towpath and other low intensity jaunts and they're easier to clean and maintain. On the other end of the spectrum; racing types have used the fixed wheel for early season training to help smooth out their stroke. Aside from the offerings shown in the article, Raliegh also has two Road SS/FG models available. Also the Bianchi San Jose has been pretty popular in this genre as well. Just to continue my long-winded love fest for the fixie, I'd also like to suggest that anyone with an old road bike wasting away in their garage might consider giving it new life by "fixing" it. With just a few component swaps and some ingenuity you could be riding your own unique one-speed. CC can help, there's at least one or two single-speed aficionados at each location.